Contrary to what you might be thinking, my continuous raving about the Mt. 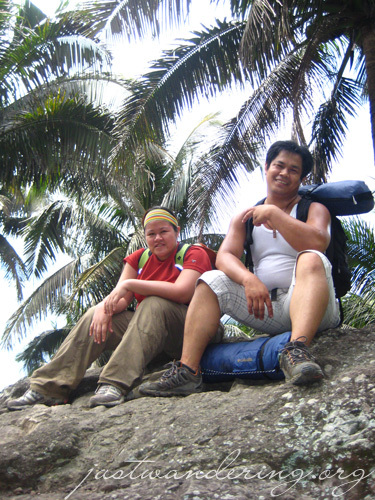 Daguldol hike really wasn’t because of the sponsorship. Don’t get me wrong — it was great to get the free gear, but it was the people and the experience that made this trip so unforgettable. It was my first trip out of town with this group. 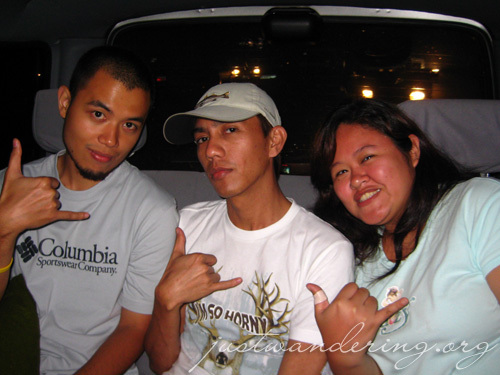 It was even my first time to meet Phoebe and Ferdz, and my first time to really get to interact with AJ and Jayvee, whom I both met in previous events. It’s actually like a school field trip. You get to know the people you share your classes with outside of the classroom. This was also my first real camping experience. The last time I slept inside a tent was the time my cousins and I stayed overnight at the cemetery during Halloween. We weren’t really roughing it because Halloween and All Saint’s Day in the Philippines is more like a huge outdoor party — there are long lines at the toilet and a Pizzahut kiosk right beside our tent. Prior to that was the camping we had for scouting back in grade school. We only camped inside the school grounds, and the school was only one street away from my house, so it wasn’t much of an experience. Though I think I did see a white lady in one of the classrooms… THIS was real camping though. With tents, camp stoves, peeing in the bushes. Then there’s the halo-halo. On the way back down to San Juan, we stopped by Mang Lizardo’s for halo-halo. 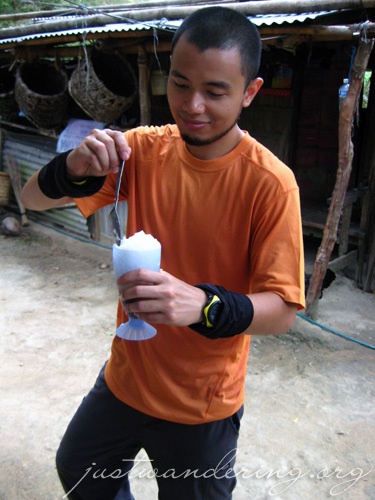 One high-maintenance hiker who shall remain nameless ordered a high-maintenance halo-halo: no kamote, no munggo, no pinipig and only one scoop of sugar. 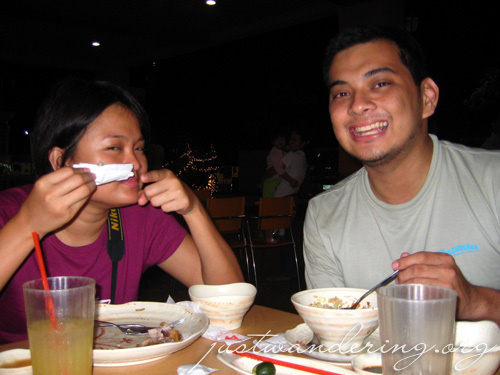 That started the teasing the high maintenance hiker got all the way back to Manila. Of course, this high maintenance hiker made things worse by commenting on the “local ice cream.” In fairness, masarap ang local ice cream! Remember, Creamline is the official ice cream of high maintenance hikers! High maintenance hikers aside, there was one blogger who made a great display of his strenght during this climb. While everybody was huffing and puffing from the exertion, this blogger was huffing and puffing away on his cigarettes. Winner! He kept up a running commentary, even singing Broadway hits, which kept us entertained and kept our minds off from the strain of the hike. To further show off his manly prowess, this tough guy pulled our van out of the muddy ditch it got stuck in on the drive back to Laiya. It’s a shame nobody got a video of this amazing display of strength. Another highlight for me was learning how to skip rocks! Though I still lack practice, I was able to get them to skip three times. Thanks for the lessons, Ferdz! that is such a cool shot of you guys jumping! I’ve always wanted to take a photo of myself jumping but could never stay in mid-air long enough…. Cayce: Believe it or not, we got that shot in one take! Love the “jumping” shot! Girl, you got some serious air in that leap! Is snowboarding in your future? Skipping rocks is a skill you’ll definitely want to cultivate. Lakes, rivers, beaches… they’re all good places to skip rocks! Practice whenever you get the chance! I enjoyed your amusing asides about your earlier camping exploits. A “white lady” in one of the grade school classrooms, huh? Interesting… is the White Lady some kind of Philippine ghost or legend? Kids at the school where I used to work, where most of the students are Filipino kids, talked about the White Lady who haunted one of the restrooms. Giggling girls used to scream and claim they saw her in the mirror. Snowboarding? Ahahahaha. Sure, when it starts snowing in the Philippines :P I’ve yet to experience snow, actually. Hmm, that should be in my to do list. Yup, a white lady is this female ghost that is… well, white. I saw her inside one classroom, and I thought she was a teacher because she was sitting at the desk. But who in their right mind would sit writing at the desk without any lights on? When I passed by again, she was standing at the window, looking over the campsite. Thanks for putting up with my out-of-tune Broadway hike concert! lolz! great scene and great opportunity to have been part of the Columbia sponsored climb. never hiked daguldol yet. maybe soon. love the pics. Looks like so much fun!